Too well known to describe. No American vegetable has gained more importance in the diets of the world’s population than corn. A tea made from corn silk, consisting of the stigmas of the flowers, has been valued as a diuretic. 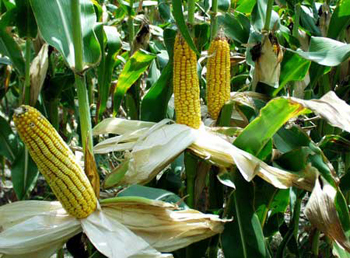 Alkaloids, ascorbic acid, cryptoxanthin, fluorine, malic acid, oxalic acid, palmitic acid, pantothenic acid, resin, saponins, silicon, sitotsterol, stigmasterol, tartaric acid, and vitamin K.
The common Indian corn is generally believed to have originated in the New World that would become the United States, where it was cultivated before Christopher Columbus discovered America. Columbus took it to Spain and many thought it was brought from Asia and it was frequently known as Turkey corn, or Turkey wheat. The active principle is maizenic acid. Native Americans used corn silk as a filler with tobacco or with August flowers, or crushed Cubeb berries. Before Columbus indian corn was unknown in the Old World. Grown on a wide scale by the Indians of the Americas, corn, as the sustainer of life, provided a major symbol in the rituals and mythologies of many tribes. One of the best known myths of the origin of corn is the one recounted in Longfellow’s poem Hiawatha. Longfellow’s source was a contemporary account written by a United States government agent, Henry Schoolcraft, who had married an Indian girl of the Ojibwa tribe from the Great Lakes region. According to Schoolcraft’s version of the myth; the Ojibwas myth has as its protagonist an Indian youth named Wunzh, who had reached the proper age to undertake a ceremony of ritual fasting. According to the custom of his tribe, he fasted for 7 days alone in a little hut in the forest to receive communication from his guardian spirit. During his fast a handsome young god wearing green and yellow garments and a plumed, feathered headdress came to him out of the sky. The god told Wunzh that he had information for him that would be of great benefit to his tribe, but that Wunzh must wrestle with him first. After 3 wrestling matches on 3 separate days, the god declared himself seduced and gave Wunzh instructions. He told him that they would wrestle again on the following day and that the match would result in the god’s death. He directed Wunzh to bury him and to water and cultivate the burial spot at certain intervals so that a corn plant would grow up there. The god told Wunzh how to harvest and cook the corn and described the process of growing it again from the kernels. Naturally, all these things came to pass, and the tribe had a great feast of celebration at their first corn harvest. The corn harvest also provided a central focus for the religious ceremonies of the Aztecs, Incas, and Mayas, whose high levels of civilization were made possible by their well-developed systems of agriculture, with corn as the major crop. The Aztecs held a yearly pre-harvest corn festival in which a beautiful young girl representing the corn goddess was sacrificed in an elaborate ritual lasting several days. Aids the kidneys, bladder, and small intestines. Take for hypertension, edema, urinary tract dysfunction and stones, gonorrhea, gout, rheumatism, bed-wetting, jaundice, and painful urination caused by the prostate gland. Acts as a diuretic. Also indicated in dropsy and heart trouble. Seed oil (corn oil) recommended as a health food for arteriosclerosis and high cholesterol. Infusion: steep 2 oz. of the herb in 1 pint of boiling water and drink several wineglassfuls a day.